Learn how to crochet with easy step by step instructions and photos. Learning how to crochet dates back to the 19th century. Many woman learned new and exciting ways to make lace doilies and decorative items for their homes or to sell to make money in hard times. Women crocheted baby clothing for their newborns or as gift for other children. These items today are also sold at many shops and clothing stores throughout the United States and other foreign countries. The first patterns were also developed in the 19th century by a Dutch magazine in 1824. What started as a necessity, is now a favorite pastime for many women throughout the world. 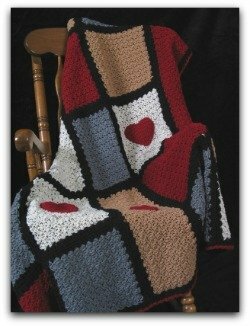 Many magazines now offer patterns for blankets, purses, baby clothing, hairpieces, doll clothing and more. Since the popularity of this craft many manufactures make items such as hooks in different sizes and colors. There are several different materials hooks are made from to include bamboo, aluminum and plastic hooks. Yarn was also manufactured in many different colors, textures, fiber content, and weights to give a variety of materials to craft your item. There are other items that are made to help with the craft such as cardboard cutouts to help make tassels and fringes, tape measures and gauge measure items to assist in counting stitches. Many women learned the craft from their mothers who passed this skill on from generation to generation. If you never had a parent that taught you this skill you can buy one or more of the many “How To Crochet” books on the market today. Hundreds of books have been published and give you step by step instructions on how to make simple dollies or blankets. In addition to the simple crafting publications there are hundreds of magazines that have intricate items for those who have mastered this skill. Some people think that knitting is similar but they actually are different in many ways. Knitting usually uses two needles and when you crochet you only use on hook, the stitches may look similar but if you compare them side by side you will see that a crochet stitch is thicker and higher than a knitted stitch even using the same yarn. Take the Granny square for instance; you cannot produce a granny square by knitting. This skill and craft is one of the oldest and most interesting crafts passed down through the years. I still treasure the baby blankets my mother made for me when I had my children. I still have everything made for me when I was a child and hope that my children pass the craft to their children.